Description: THIS IS A COLT WWI U.S. ARMY MODEL 1917 RIG, .45 CAL.THE REVOLVER IS IN VERY GOOD CONDITION (90% + ORIGINAL FINISH), ALL ORIGINAL, NUMBER MATCHING, VERY GOOD BORE AND GRIPS, MECHANICALLY CORRECT AND TIGHT. 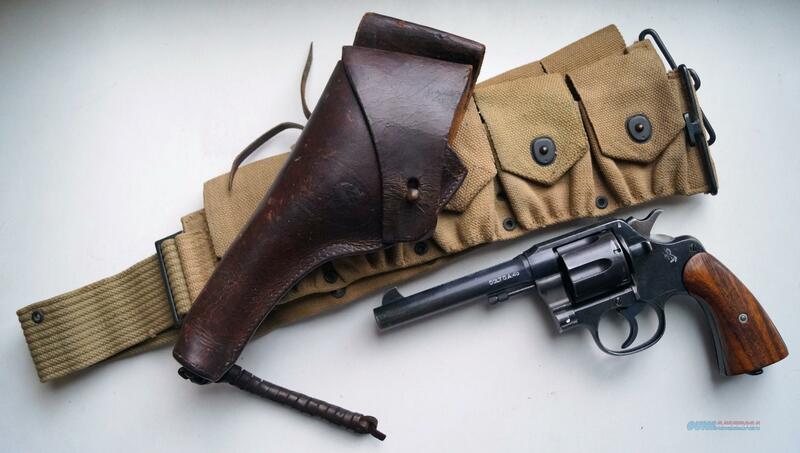 THE RIG CONSISTS OF THE REVOLVER, 1 ORIGINAL 1917 DATED HOLSTER AND1 ORIGINAL 1919 DATED CARTRIDGE BELT. THEY DON' T COME BETTER THAT THIS.